One of the silly things I sometimes dream about is owning a gourmet food shop/café. I know that the food business is HARD and it’s not something I see myself actually going into (hats off to those of you who have! ), but I can’t help but fantasize about what my little place would look like. There are so many gorgeous upscale gourmet food markets out there, though unfortunately, we do not have any left in Houston. I think more than wanting to own a food shop, I would really just love a place like this to frequent in my hometown. These spaces are a gourmand’s dream. 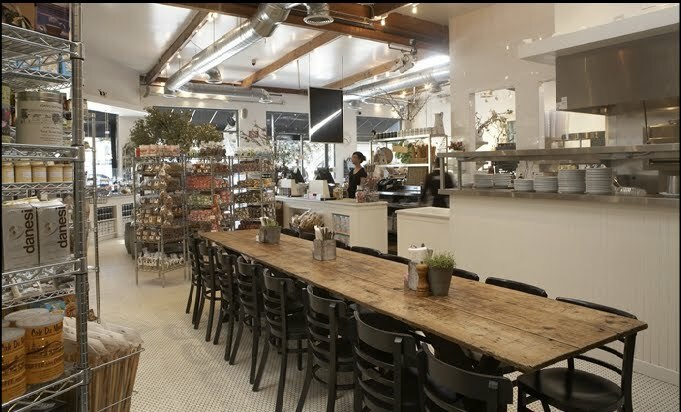 Do you have a well-designed, gourmet shop in your town? I miss gourmet shops and all the fresh Italian breads... my favorite! Oh, what about the pastries! Wow! I agree! These bakeries are ones that call my name everyday....I have to take it easy or I can spend all my money on French lattes and almond croissants! Love this post! I totally agree, great design in a cafe/diner/shop is a must. I love the design in Joan's on Third. Paloma - do you have a Le Pain Quotidien anywhere near Houston? Same vibe you are digging. We have one in Alexandria VA and I wish I could camp out there and walk by for a morning cup o coffee and croissant. thanks for the post!! I absolutely agree. Those photos are great choices for a gourmand. I love it. Hudson & Hubbell is a great gourmet shop/ grocery/restaurant right up the road in the Woodlands. You could definitely get your 'fix' there! Gourmet grocery stores are fabulous. They are very Paraisan. I would love to have a gourmet grocery near me. love all the photos. you would like star provisions in west atlanta. it would fit right in with this post. Caviar & Bananas - http://www.caviarandbananas.com/ - is my favorite market/cafe in my home away from home, Charleston, S.C. I stumbled upon it on one of my recent visits and now its my favorite quick lunch spot! I've yet to find its equal in Boston.